Links: IMDB / Rotten Tomatoes 65% out of 119 reviews. I'd been wanting to see Adam for a long time but somehow I missed it at the movies. Last night, I finally got to sit down and watch it with my wife. Adam is a romantic drama about a couple in which the male, Adam has aspergers syndrome. Aspergers is specifically mentioned and described in the screenplay and the film makes a very good attempt to show what life could be like for a person with aspergers. Adam's special interest topic; space, is up there front and centre but his other obsessive behaviour, while hinted at, is generally given a back seat in the story. It's clear that he eats the same meals every day and that he likes to have things lined up but the film doesn't dwell on it. The film also shows some literal interpretations and communications difficulties but again it doesn't dwell. Finally, there's a meltdown shown - again, the film doesn't dwell but moves on with the story. I think that the fact that the film skirts around the issues rather than dwelling on them is good. It could have been a comedy of quirks but director Max Mayer has wisely kept the focus on the relationship rather than the oddities. As such, there is a lot of heart and realism to the film. The film begins at Adam's father's funeral (his last surviving parent) and it looks at the difficulties that people with aspergers encounter when trying to become independent. Along the way, we are introduced to Harlan, his mentor and in the course of the film we see just how important it is for aspies to have a mentor. The film looks at Adam's black and white interpretation of events and the struggle he has to make himself seen and heard. It also looks at things from the other side of the relationship through the eyes of his somewhat too understanding girlfriend. The accuracy of Hugh Dancy's portrayal as Adam is astonishing, though there were still a few things that my wife and I felt were a little un-aspie. In particular, Adam initiated the first kiss and chose an appropriate moment - this could have been pure luck but it was a fairly un-aspie moment. There are a couple of other places where this sort of thing happens but I won't spoil them for you. My wife was also not too pleased with the film's abrupt ending but I felt it was more "true to life". I was expecting a comedy but while there are some funny moments, Adam is first and foremost a drama. It's a film for everyone but especially it's a film for aspies and the neurotypicals who love them. I really enjoyed this movie, my husband and I watched it a month or two ago. I thought that it was pretty well done, and the characters were believable. It's definitely a cute movie and worth watching if you're an Aspiephile. It's true that there are a few non-Aspie moments, but not all Aspies are the same and some have strengths in certain areas and not others. As the saying goes, "You've met one Aspie, you've met one Aspie". Overall, the movie was enjoyable, though I didn't like the ending, either. Thanks for the review - I have just added it to my Netflix queue and am looking forward to seeing it soon! Hi Gavin, I am curious about the comment you made "a little un-aspie. In particular, Adam initiated the first kiss". Please explain. I am a NT in love with an Aspie male. Our friendship began 2 years ago and we have been going out for 1 1/2 years. We have hugged since day one. After 1 year we started holding hands. As of 2 months ago we snuggle when we watch movies at his apartment, but he has not kissed me yet. We are both divorced and in our 40's. I have made every first move to show affection, but I just cannot kiss him first. I need to know that he cares for me too. I have been reading your blog for over a year and it has helped me in so many ways. I value my aspie friend very much. I realize he is unique and special in his own way and I am a better person for having known him. I truly appreciate what an amazing man he is and I do not want him to change, but the desire to kiss him is unbearable at times and I do not know what to do. Definitely one worth owning and sharing with family and friends! I loved this movie, mostly because after my husband and I watched it, he bought me flowers and thanked me for understanding his "quirks". It was very sweet. 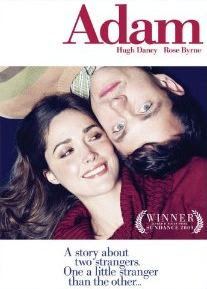 I have Aspergers Syndrome, and watched the movie Adam with the hope of finding a movie that I may be able to relate to. To begin with, the story was gripping and the introduction to both characters, Adam and Beth, was charming and I could not pull myself away. It was clear that Adam had severe Aspergers (as it can vary in severity) and struggled with social interaction, as many of us do, especially as his main support, his father, had gone. This was where Beth came in. Suddenly a person whom had little knowledge of AS, fell for the honesty and loyalty of a man who had little experience of romance. But, alas, this warmth and charm was not to last. Instead of holding on to love through the thick of it, as one would hope, it waned and felt as if the pair had simply given up. Although, hope sprang up once again with a determined Adam, fighting his way through the elements to Beth's home. But I was let down by the lack of an apology, which he is capable of, and the need for him to have support, although he had just managed to use the subway and walk miles to find her, without support. Although, maybe I missed the point. Maybe the greatest outcome was Adam finally being able to take control of his life without reassurance. But I do not understand why love could not prevail. But maybe that is my naivety. I found the ending disappointing and the final message, 'They did not belong there, but there they were' offensive. For I felt that that was intended for, and related to, Adam. Why should he not belong anywhere? However, once again, maybe I have missed the point. Maybe, as many reviews have said, it is a drama, not a romantic comedy. Maybe it is not so much an end, but a slice of life. Apologies for the repetition of 'maybe'. My boyfriend who has aspergers actually initiated first kiss so I think it's believable...Although he is not as severe as Adam in the movie. I too am into Space Technology. It has been my main career for the past 30 years. It was also my first job and the job I wanted. My ex criticized me that my first kiss was a peck. Like something you'd give your mom. Oh well. We were together almost 25 years! Unfortunately, we're separated now. Mainly as a consequence of my condition. I think we'd probably still be together had I known about my condition much earlier, because I would have better known how to go about it, instead of "shooting in the dark". But, for now, I guess I'll know better for my next love, whoever that will be, if I ever have one, for the life I have left. Hi, my name is Syamila from Malaysia and I have an assignment on psychological aspects that is portrayed in the movie Adam in regards to Asperger's Syndrome. If it is not a burden, may I ask for further explanation on your views regarding the movie. And maybe I could get a link to any websites that could explain more on the syndrome. I would love to hear any responses from you. Thank you in advance. Adam is the dramatization of but one depiction of how Aspergers is manifested. From a movie standpoint it seems at least that the writers, producers and actors did do some research. Just a cautionary note. If you’ve met one person with Autism or Aspergers, you have met one person with Autism or Aspergers. Not all are the same, tho often we may share common traits. The movie helps raise awareness of this natural variance in humanity and it lends humanity to what many people regard as lacking thereof. To get a wider scope of Aspergers / Autism tho, you will need a larger sample size than just one depiction.